April 13, 2012 March 13, 2017 Joanna V.
Tonight I baked rainbow cupcakes for the tea party tomorrow. It’s a Mad Hatter tea party and what better thing than crazy, mixed up cupcakes for such a thing? And a close view of the inside. This one didn’t have much pink in it, but some of them do. It just depends on how we layered the better. Rainbow swirl cupcakes are super easy– just divide your cake batter into separate bowls, dye them differently, and spoon the bits into the cake pan or muffin pan. They don’t remix unless you stir them together yourself, and you end up with nicely divided layers of color. 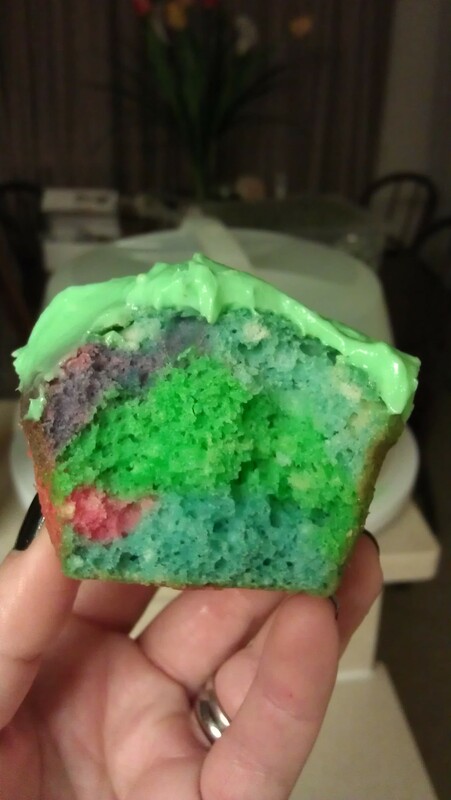 This was a white cake mix to start to make the colors more vivid, but you could do it with different cakes, too- i.e. chocolate with yellow, or red velvet with white (might have to try that myself) or lemon with white… etc. 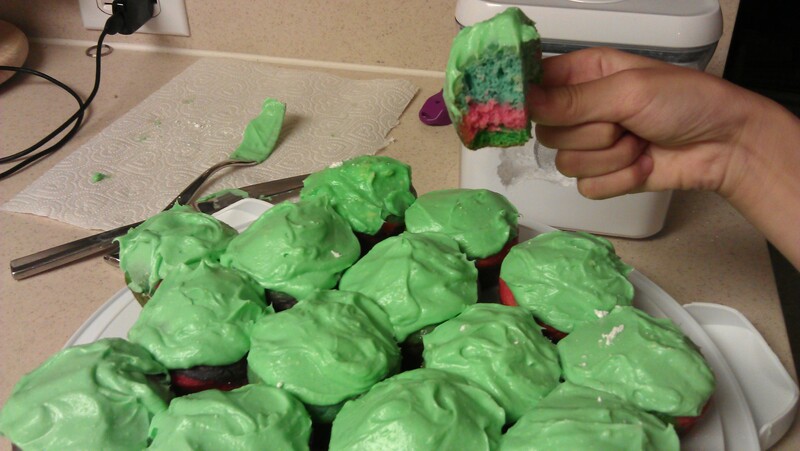 The frosting was my usual go-to, just dyed green: 1 pack of cream cheese, 1 stick of butter (softened) and then confectioner’s sugar until it looks right. Stir until your arm’s about to fall off and then the lumps should be gone. Easy peasy. And I’m all about easy peasy homemade stuff.